Do you have bottles of nail polishes lying in your room that has seen better days? The once pretty lacquer have dried out and are now too thick and gooey to apply a nice even coat on your nails? What do you do - toss out the half used bottle or try and savage it? Being the beauty hoarder, I decided to take the latter path and tried various methods to see if I can get some more use out of it before it hits the beauty graveyard. I've tried adding a few drops of nail polish remover into the thickened formula to thin it out but polish removers are usually made from acetone and although it does thin the formula, it also affects the colour and shine of the polish. 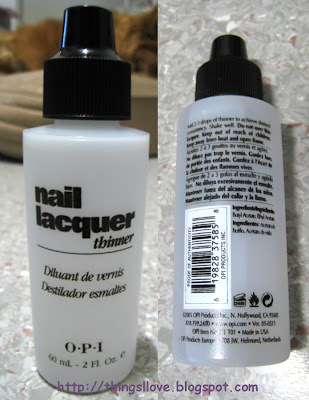 My search ended when I found OPI's Nail Lacquer Thinner. made from butyl acetate and ethyl acetate - the same ingredient in lacquers so does not affect finish of end product. large bottle that lasts a long time as you use very little. add two drops in first and shake well to check if product has thinned down to the right consistency - best way to tell is to apply a coat onto nail to check if it out. If it is still too thick, add one drop or two more and repeat till your polish is back to perfect consistency again. can improve consistency of streaky polishes. I have tried this on my b Collection by Bloom Ibiza lacquer and it has definitely fixed its formula problem - I'm ecstatic with its finish now. Sadly, Oslo was a lost cause and despite being the right fluid consistency, it is still as streaky as ever. If you have a favourite nail lacquer shade that has become too thick but want to save it from dying an early death, give this thinner a try - you will get many more uses out of it. Just what I need!! I bought a brand new OPI polish not long ago and it was overly gooey compared to the other shades.. I know how annoying right? This stuff will solve the prob ASAP.